about 300 emergency calls locally and in the County. Welcome to our website. Here you can learn about Bransgore Community First Responders, meet the team and our supporters and see how the scheme works. We do hope you enjoy your visit. 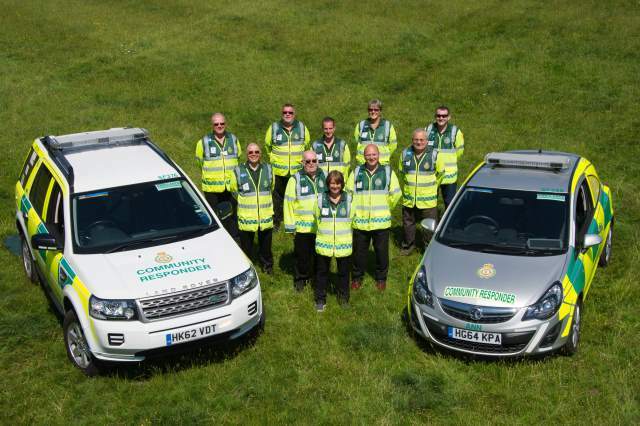 Community First Responders are volunteers who are trained to attend emergency calls received by the ambulance service and provide care until the ambulance arrives. They attend calls in their local area, therefore, the potential for them to arrive on scene before an ambulance, especially in rural areas, is vital in providing immediate life-saving treatment. Like other schemes in Hampshire, Berkshire, Buckinghamshire and Oxfordshire we are part of South Central Ambulance Charity (Reg no 1049778). Click here to visit their website and you can see our group's webpage by clicking here. Please visit our news pages for the latest and pop back regularly. We are now on the world of FACEBOOK!! Please visit our page there and also that of our colleagues from Heartstart Bransgore-New Forest. Just some of the equipment we carry.